Do we really own the rights to Privacy and Security relating to the data stored about us? Google, Twitter, Microsoft and Facebook have all come under fire for allowing data to be viewed or accessed by 3rd parties. (Sangani 2010)Privacy policies have not been tight enough in the past. The data for example on Facebook is also owned jointly by you and Facebook, Facebook owns any IP you give it because you gave it permission via the Facebook statement of rights and responsibilities. (Facebook 2013). Security is focused around the user protecting the data and access as much as possible themselves. Analysts IDC estimate that only 20% of the digital world has protections around privacy and security and the level of protection varies globally, there is also much less protection in emerging markets. (Gantz and Reinsel 2012). The data and information is always owned solely by yourself when it is under your control and until you let it out to a third party. In the new digital world data privacy and security understanding is lagging behind the adoption and use. Information on how companies protect your privacy and security is varied and tends to be in the small print of privacy and security statements. When you have given over your data to a 3rd party in most instances the data is now owned by the 3rd party that is custodian of the data, you might have the rights to obtain a copy of what they hold and adjust in accuracies but not the rights for them to copy or use the data for their business purposes. (Pentland 2014). There is only one way to keep your information private and secure and that is not to share it in the first place, but is that really possible in the connected world we live in today, realistically probably not but could we change the model now? Artificial Intelligence (AI) that incorporates Autonomous (Intelligent) Software Agents are being exploited more and more to resolve complicated challenges. The applicability of these solutions bring some benefits however, based on current focussed research trends and limitations associated, the opportunity and possibilities that this technology brings has not yet been fully realised. To look at this further we need to break down and understand the basic definition of what AI autonomous intelligent software agents are. Decentralisation of the tasks to agents allows each agent to execute tasks at their most reliable manner as they are able to. The agents are not tied to centralised system that will allocate and execute tasks as needed. Agents as stated are artificial creations that execute tasks assigned to them without doing anything greater than or less than the predefined task assigned. Developing technology such as Intelligent Software Agents isn’t easy and not that cheap to do, but over the past years this industry has grown significantly. Once they have been created though training an agent or creating groups of agents doesn’t need a very high level of skill. (MASSIVE Simulaing Life 2013) Therefore because of this companies have to see a business reason for using the technology to get a return on their investment. Software agents are in are actually more normal than we really think about. BROOKSHEAR, J Gleen, SMITH, David T and BRYLOW, Dennis (2012). Chapter 11: Artificial Intelligence. In: HORTON, Marcia (ed.). Computer Science – An Overview. 11th ed., Addison-Wesley – Pearson, 461-500. If Hugh in Memory (RAM) Computing Systems were available. If Random Access Memory (RAM) in computing systems was almost unlimited as it might be in the future, this would have a significant affect the way data or files are accessed, stored from a performance, structure, availability and longevity perspective. RAM is available in two types, Dynamic (DRAM) and Static (SRAM). DRAM most common in computers today. DRAM is required to be refreshed with data every few milliseconds whereas SRAM is used as cache memory due to it begin a lot faster than DRAM, secondly SRAM does need the data refreshing like DRAM does. RAM is a volatile type of data storage effectively data is only available while the memory is powered. File structure is the definition how data is structured, organised and stored in secondary memory. These file structures are usually created and organised to minimise the impact on I/O from disk access. RAM is very quick at reading and writing date to run applications. (Trivedi 2013). Storage devices would be significantly be impacted by the change in methodology with the availability of more in memory type computing systems. Memristors work by remembering a previously-applied charge in the form of a resistance when a charge in the circuit is reversed. Phase-change memory (PRAM) uses heat to exploit the unique behaviour of chalcogenide glass to switch between an amorphous and a crystalline state, thereby storing binary data. Racetrack memory or domain-wall memory (DWM) offers higher densities than flash and performance similar to that of DRAM. Atomic memory Atomic scale memory uses a scanning tunnelling microscope to perform this feat – and one would be needed in order to read the memory. In memory computing will happen it is happening today but will become more prolific over the coming years as great performance for all types of data and file access is required. Significant rethinking and use of algorithms and complex querying will be enabled. Persistence of data and retrieving data in to memory is an issue today but is being overcome by the change of traditional storage devices to flash or new types of storage based devices and more this type of storage becomes mainstream and standard the more performance at the computing level will be require thus more in memory computing systems will be used. BROOKSHEAR, J Gleen, SMITH, David T and BRYLOW, Dennis (2012). Chapter 8: Data Abstractions – Lists, Stacks and Queues. In: HORTON, Marcia (ed.). Computer Science – An Overview. 11th ed., Addison-Wesley – Pearson, 341-345. BROOKSHER, J Gleen, SMITH, David T and BRYLOW, Dennis (2012). The Concept of an Algorithm. In: Computer Science – An Overview. 11th ed., Addison-Wesley – Pearson, 189-200. I was showing my daughter what I used to use as a computer many years ago (showing my age) and she was amazed more astonished so I thought I would share with you all a brief trip down memory lane. First of all if you can remember the Commodore 64 (C64) a 1Mhz, 8 bit, 64k RAM (Commodore Computers, 1983) computer created by Metal Oxide Semiconductor Technology (MOS Technology) also known as Commodore Business Machines (Veit, 1999) should be listed as one of the most symbolic and state of the art personal computing systems of the 1980’s. The C64 was focussed to provide a great video game machining experience, outstanding performance and value for money compared to the other market players of the time. · The C64 made it into the Guinness Book of World Records in 2007. As of 2006 the C64 was the “Greatest selling single computer of all time”. Sources count units sold between 12 and 17 million (Peggy Mihelich – CNN, 2007). Apple iMac G3 computing system should be badged as the system that ignited the drove colour into the personal computer industry and enable internet experience. What also made the iMac a focus was it marked the return of Steve Jobs as Chief Executive Officer (CEO) role. · Making iMac G3 more user-friendly, with attractive design translucent back and at the time of i for internet, built in browser and modem enabling internet access brought Apple in to the future, on this Steve Jobs interim CEO 1997 (Stone, 2011) started to rebuild the company. The built in speakers and internet access was personally a simple and easy to use experience. Bagnall, B., 2005. 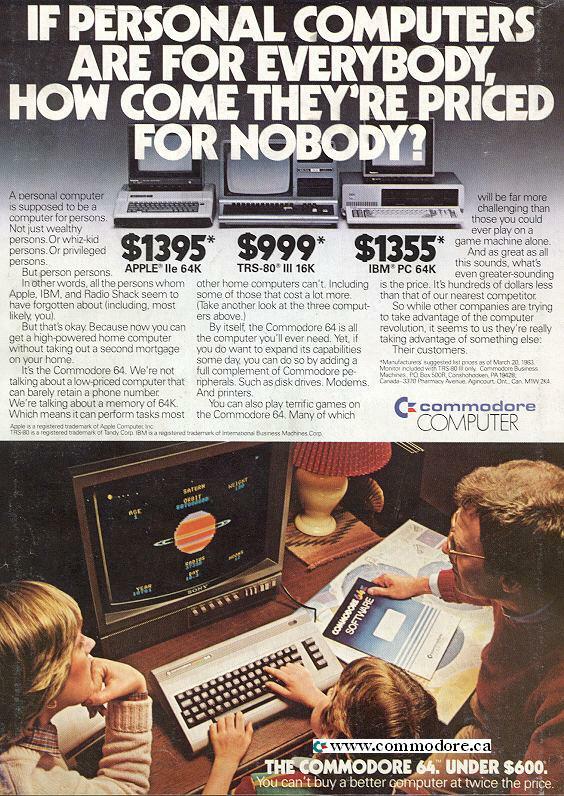 On the Edge: the Spectacular Rise and Fall of Commodore. First ed. s.l. :Variant Press. Channel, T. A. H., 2006. Steve Jobs introducing The First iMac 1998. [Sound Recording]. Why not wake up every day, forget yesterday and think about how I can make a difference for customers today and in the future. I have a strong passion and belief that each one of us is looking for a life experience every day. In an Information Technology (IT) driven world the focus of the experience relates to a physical technology, usage interaction and support personality experience, this is what can build confidence, enjoyment, relationships, support change and fuels the ability to deliver amazing results. With this in mind, I believe that everyone is a consumer be it a college, other business user, a vendor, or everyone that we interact with. The way we think about and use IT and innovation, be it in business or personally, can be an amazing enabler as long as the vision, strategy, and technology are correctly executed. Delivering the right technology and innovation are the only methods that can truly support change or radically impact a company’s P&L, as well as improve our lives. I often say, to my team to think like the Chinese saying “From Crisis/ Issue becomes an opportunity”. Therefore we should stop highlighting the crisis and figure out why there is a crisis or issue existing and the work on solving this using the best basic principles of how do we deliver for the customer / user the right service in the best possible time with the best quality, keeping it simple and supportable. The opportunity is that change is a given, we can’t stop change. Actually every day we enable change so instead of fighting change we need to embrace and work in an adaptive, agile manner to make change easier. Question: Isn’t there something in life that we should have a passion about. I would ask myself why we aren’t all aligned on WHY’s not HOW’s and WHAT’s, why are we doing what we are doing and how do we make IT happen? Software-defined networking (SDN) is an approach to computer networking which evolved from work done at UC Berkeley and Stanford University around 2008.SDN allows network administrators to manage network services through abstraction of lower level functionality. This is done by decoupling the system that makes decisions about where traffic is sent (the control plane) from the underlying systems that forward traffic to the selected destination (the data plane). The inventors and vendors of these systems claim that this simplifies networking. SDN requires some method for the control plane to communicate with the data plane. One such mechanism, OpenFlow, is often misunderstood to be equivalent to SDN, but other mechanisms could also fit into the concept. The Open Networking Foundation was founded to promote SDN and OpenFlow, marketing the use of the term cloud computing before it became popular. Changing traffic patterns: Applications that commonly access geographically distributed databases and servers through public and private clouds require extremely flexible traffic management and access to bandwidth on demand. The “consumerization of IT”: The Bring Your Own Device (BYOD) trend requires networks that are both flexible and secure. The rise of cloud services: Users expect on-demand access to applications, infrastructure, and other IT resources. “Big data” means more bandwidth: Handling today’s mega datasets requires massive parallel processing that is fueling a constant demand for additional capacity and any-to-any connectivity. Complexity that leads to stasis: Adding or moving devices and implementing network-wide policies are complex, time-consuming, and primarily manual endeavours that risk service disruption, discouraging network changes. Inability to scale: The time-honoured approach of link oversubscription to provision scalability is not effective with the dynamic traffic patterns in virtualized networks—a problem that is even more pronounced in service provider networks with large-scale parallel processing algorithms and associated datasets across an entire computing pool. Vendor dependence: Lengthy vendor equipment product cycles and a lack of standard, open interfaces limit the ability of network operators to tailor the network to their individual environments. How I see software defined networking (SDN) is in a simpler way SDN is what hypervisor’s have done to the x86 platforms over the past 10 years, SDN to me should be looked at as the method to disconnect or decouple the physical network hardware layer for the network and the logical traffic and rules that run on that physical network. I.e. think of it as a SDN equals the Hypervisor for the Network (all of the network from the mobile client to the core cloud datacentre). SDN doesn’t have to just be switching either it can be all the network from switching, load balancing, access control, firewalls, mobile connection, virus and IPS, SDN can be used for the whole network. Networking of the future could be simple, configuring your network could be as easy as dragging and dropping icons on a desktop or installing an application from itunes, really could take seconds to create a network for 10 devices or 1 million devices. No need any more to worry about thinking about IP masking and routing and limits because of the physical limitations and cables. What I would say today is everyone should be investigating SDN across their network infrastructures from the mobile network through to the cloud data center. Using SDN to automate and deliver service will become the most cost efficient and simplest Maner without thinking physical limits having closely stack based physical / logical solution, no more top or rack or end or row. Think of the physical cost saving also power, space, upgrades and redundancy. Can we afford to not look at SDN should be the question we are all asking ourselves? Some interesting links and possible useful links to help in your research. The way we learn and have to adapt into methods of continuing educating ourselves in today’s new digital virtual / social world have changed from the way’s we used to interact with education media’s. One of these methods in heavy use today is online learning, be it basic cooking classes through to University Degrees. Some of the Benefits of Online learning are. Anyone can take classes anytime and from anywhere parents can take classes when children are in bed or at school. Fulltime employed workers can manage to take classes around there work patterns and their schedule. Business people or family members that travel for can still attend their classes from anywhere that has an internet connection. Students that live in remote areas such as the Australian outback can interact and learn as a group via online courses. Students can attend course classes when they not feeling tired after a long day at work or when they are feeling well enough. Instead of having limited access to class time or student advisors during working hours, the student can log online into their virtual class room course or modules any time to review instructions, assignments, working groups, library, or get access to additional resources that might be hard to access in a physical world. In an online virtual world of learning students from all around the world can work together with lectures, student advisors, teachers, instructors and peers. Students are able to interact with people in different location with different experiences and knowledge that might not be able to happen as much in physical world. The “anonymity” of online courses often makes it easier to students to participate in group discussion (or forums). They don’t feel all the eyes on them. Students also have time to compose their thoughts before responding. The conversation in real life might have long moved on, but online the student can still respond to a previous idea. Online courses often take advantage of the different types of resources available, such as videos, images, sounds/ music, and alternate viewpoints. While many classroom teachers try to keep up, technology in the classroom does not always facilitate this bonus material. Associated costs such as travel (vehicle, fuel, parking or even public transportation) may be reduced or even eliminated with the use of online learning versus physically attending classes on campus environment. Another reeducation for parents with young children can include child care costs as a babysitter, minder, crèche, or other full time childcare wouldn’t be needed. As you aren’t using a lectures, student advisors, teachers, instructors and peers time or any room or equipment, eLearning tends to be the much cheaper option than a physical one. People might have access to personal digital device capable of carrying out the training on be it a personal computer or tablet style device, then the savings can be even more considerable. John E. Reid, Jr. Ph.D.
Caroline Haythornthwaite and Michelle M. Kazmer, eds. Peer-reviewed, open-access online publication focused on exploring the use of multimedia in virtual learning settings. Online degree programs available to them in geographical region and desired subject area. Alexander, Shirley. Teaching and Learning on the World Wide Web. AusWeb 97 Conference. 1997. http://ausweb.scu.edu.au/.